A very cute little pig. Stevie the pig lived in the stable next to Bella our new resident horse (see earlier blog) and, If Bella’s conditions were squalid, Stevie’s were appalling: a tiny, three-metres-by-one-metre space, never cleaned, no water, no light. At least Bella got to go outside sometimes. Stevie was stuck in her cage and more or less forgotten. A couple of days after Bella arrived at Donkey Paradise, a space was prepared for Stevie in Stable Zero and she was brought to the sanctuary. Marleen’s old dog Jolly normally occupies the back seat in her Pajero, but this day, her bushy black-and-white tail was displaced by the constantly wagging little tail of Stevie, who oinked all the way from Arriondas. 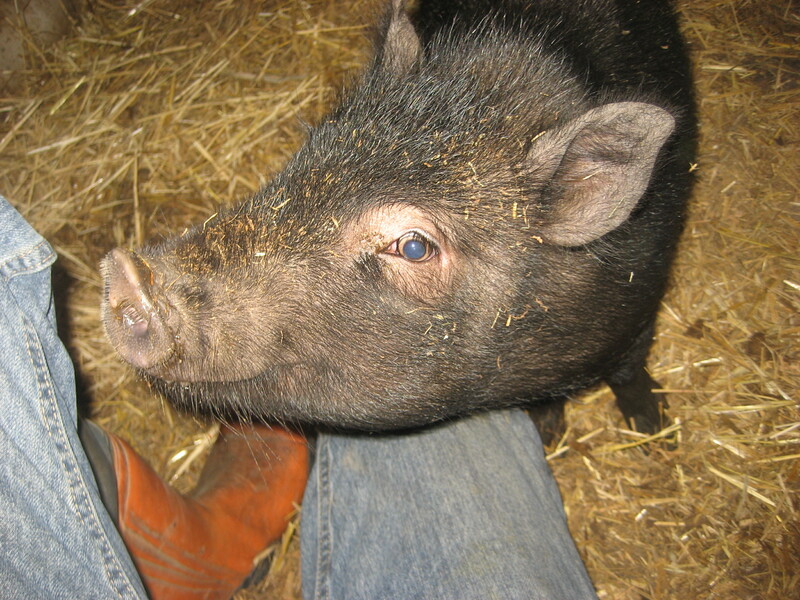 In fact, Stevie oinks almost all of the time, whether she’s being fed or watered or left alone. The only time she stops is when she’s picked up. This prompts the most terrible squealing, as if she were about to be killed. Once we got her into her half of Stable Zero and set her down on the bed of straw, the squealing stopped and the happy oinks returned. A new arrival always prompts interesting responses from the established creatures. Stevie has particularly drawn the attention of the Donkey Paradise dogs, who often scurry up to her gate to sniff or bark. (Whether or not they want to eat her or are simply curious remains in question.) Unfortunately, Stevie’s stablemates Elfie and Finn – a mule and an Asturian horse – are not so thrilled about the new arrival. When Stevie was brought in, they immediately retreated to the far side of the stable, where they stayed until the following morning. Getting them out into the fields in the morning or into the stable in the evening used to take five minutes; now it takes half an hour. Sometimes, it’s not the new arrivals that need to be managed more carefully but the animals who already here and have to adjust to a different routine. It’s still early days, but Stevie’s transition appears to have gone very well. Volunteer Tara has worked with Marleen on getting her feeding regimen right, and volunteer Ille is preparing a mud bath to go in Stevie’s quarters. Then she will be able to cover herself in mucky, stinky, piggy glory. I will never forget the early morning of the 4th of August 2015. Marleen went into stable 4 to do the morning feeding. Stable 4 is the home of mother and daughter Burri and Burribu, the ‘evil sisters’ Eyore and Fiona, and pregnant Xana. As the ladies were quite wild, I followed right behind Marleen to help her. Then I saw the expression on her face… Marleen looked like she just saw a ghost. Her jaw dropped, she held her breath and pointed. ‘Look!’ she said. 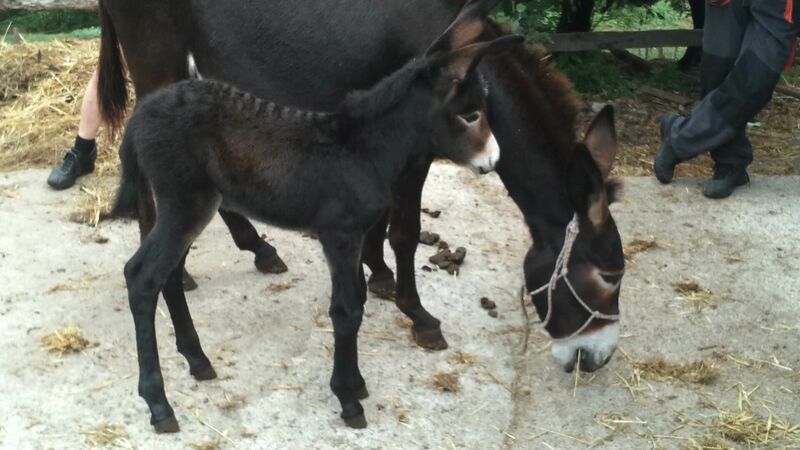 And there, in the middle of the stable, stood a little miracle: a brand new, fluffy, furry, perfect baby donkey. Everything about her was perfect. Her beautiful long ears, her cute white nose, her wobbly legs, her curved little hooves, her big bright eyes. She was clean, she was standing and her mother looked like she had no idea what all the fuss was about. We had tried to prepare ourselves. Marleen had informed the vet; we had a little stable where Xana could deliver; co-volunteer Tom had checked Xana every day for signs of an upcoming birth… and then Xana went her own way and gave us the biggest surprise the next morning. Proud mum Xana with her little daughter. Franka – named after the Dutch volunteer couple Frank and Helma – is two weeks old now and seems in perfect health. She jumps and runs around in the field, got acquainted with many aunts and uncles and looks exactly like her mother. Xana is in fact a teenage mom. She got pregnant when she was only one year old. She was meant to have babies every year until she would be worn out and ready for the butcher. Marleen rescued her in October last year, a shy and scared young donkey. And look at her now! She behaves like a perfect mother to Franka and the future of mother and daughter looks bright. 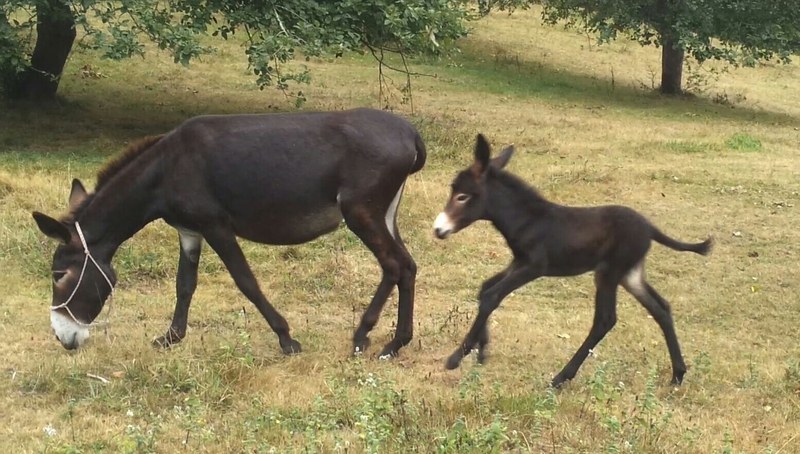 Franka, our little miracle, born in a donkey’s paradise! Franka is enjoying her freedom.